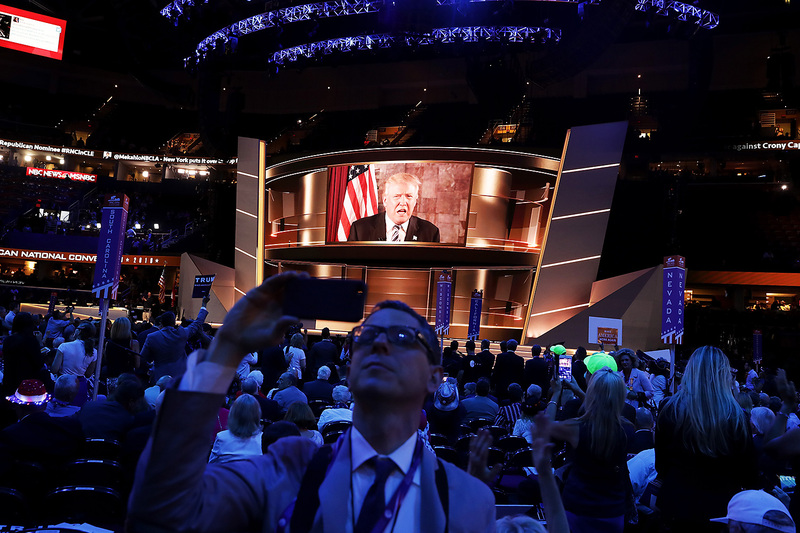 Republican presidential candidate Donald J. Trump speaks on a screen from New York City on the second day of the Republican National Convention, July 19, 2016, at the Quicken Loans Arena in Cleveland, Ohio. Trump received the number of votes needed to secure the party’s nomination. As a lame duck president in 2001, Democrat Bill Clinton successively lobbied for China’s entry into the World Trade Organization. Donald Trump has described this single political act as the worst trade deal in American history, and the following statistics certainly support that assessment: Since China joined the WTO, over 70,000 American factories have closed. Average median household income has remained stagnant. Our annual GDP growth rate has been cut to almost half its historic average. Over 20 million Americans can’t find a decent job at a decent wage. The U.S. now owes China over $2 trillion dollars. Donald Trump’s position on trade is revolutionizing a Republican Party that has, along with Democrats like Bill and Hillary Clinton, exhibited a blind faith in a free trade ideology—even as these ideologues have turned a blind eye to China’s massive mercantilist cheating. This is a revolution because Donald Trump will no longer tolerate “free trade” that isn’t also fair trade. What does “fair trade” mean? In the context of China, it means that the People’s Republic must once and forever stop using “weapons of job destruction” to attack the U.S. manufacturing base and American workers themselves. These carefully documented weapons include illegal export subsidies, currency manipulation, intellectual property theft, and China’s rampant use of sweat shops and pollution havens. In addition, China also engages in “forced technology transfer” in direct contradiction to the rules of the World Trade Organization. For example, in order to participate in the Chinese market, companies such as Boeing, General Electric, General Motors, and Intel must transfer sensitive technologies that China will then use to outcompete these American rivals. On top of all these unfair mercantilist trade practices, China also engages in all manner of protectionist non-tariff barriers. Donald Trump has said loudly and clearly to both China and the American electorate that this kind of mercantilist behavior shall no longer stand. Free trade must also be fair trade, and Trump will use every policy instrument at his disposal to level the playing field, not just with China but with any country that engages in unfair trade practices. To those who say the new Republican Party will be “protectionist,” Trump says that there is a very clear difference between defensive tariffs to shield America from cheaters and the kind of protectionism countries like China engage in. Indeed, it was the free trading Ronald Reagan who slapped defensive tariffs on a cheating Japan in the 1980s—Trump will do the same to any country that continues to cheat. To those who say Donald Trump will start a trade war, Trump says we are already in a trade war—and it’s long past time we fought back. This undeclared trade war started in 1993 when Bill Clinton signed NAFTA and promised America 200,000 new jobs—and then we all watched as America lost over 700,000 jobs instead. And that undeclared trade war took on a whole new dimension when China began flooding our markets with its illegally subsidized exports in 2002. From a purely macroeconomic standpoint, Trump is absolutely correct that the best jobs program is not more fiscal and monetary stimulus—which has only doubled our national debt since Barack Obama took office while skewing the balance sheet of our “quantitative easing” Federal Reserve. Rather, Trump knows that America faces a structural problem of chronic and massive trade deficits that can only be handled through far-reaching trade and tax reforms. China’s dictatorial one-party regime, its mercantilist “beggar-thy-neighbor” policies, and its increasingly aggressive stance in the region do present real challenges to America’s values and interests. Ironically, on the first, Donald Trump appears to comment approvingly of the “strength” Beijing showed in suppressing peaceful protest. On the second, Trump seems to believe the answer lies in aping China’s approach to trade as a zero-sum, win-lose proposition. On the third, Trump—who has never given any sign that he knows or cares to know what is happening in the South or East China Seas—has recklessly called into question the very alliances, with South Korea, Japan, and others, the U.S. relies upon to counter China’s growing ambitions and protect our interests in the region. There is plenty to criticize in current U.S. policy. Around the world, President Obama has repeatedly, and unwisely, drawn “red lines” and then declined to enforce them, giving Beijing confidence that it can call our bluff, whether on freedom of navigation or cyber raids on the U.S. government or U.S. companies. President Obama has, mistakenly, pointed to China’s state-led investment programs in solar energy and high-speed rail as examples the U.S. should follow, even as they turned out to be costly boondoggles. And he has abjectly failed to build popular or political consensus for a trade deal (TPP) that he made the litmus test of U.S. credibility in Asia. Republicans can and must do better. We must draw clear lines with China that we are willing to defend, improve and build upon—not turn our backs on—the alliances that make this possible. We must make the case that for Americans to thrive, we must thrive in a global economy that isn’t going away. Rather than imitating the Chinese and building walls, we must go out and strike deals that present China with a choice: open your markets, like us, or get left behind. And finally, we must speak critically, not admiringly, of dictatorships that bully their own people. Even if his figures were right, his claim that what happened after China joined the W.T.O. is because China joined the W.T.O. is unsubstantiated. A big problem with explaining trade is that costs tend to be concentrated and benefits more diffuse across the economy. I think the Autor/Dorn/Hanson paper “China Shock” has driven a lot of the trade debate in this cycle (much as that Rogoff/Reinhart paper, “Growth in a Time of Debt,” drove debate on austerity in the U.S.). Unfortunately, Donald Trump has repeatedly evinced nothing but disdain for bedrock American principles of tolerance and inclusiveness—principles that distinguish this country from China far more profoundly than language, geography, ethnicity, arms, or the respective quantity of our cash reserves ever can. I can imagine of few strategic setbacks more profound, few single events more damaging to our position vis-a-vis China, than Trump’s election to the presidency. Worrisome also for our relationship with China is the fact that thus far Trump has shown himself to be a terrible manager. Unwilling to share authority outside of a tight inner circle, evidently mercurial and moody in temperament, and most comfortable communicating with constituents through vacuous and angry tweets, Trump has seen his campaign lurch from embarrassment to embarrassment. The prospect of him managing the U.S. Government—the most complex and powerful organization the world has ever seen—is frankly terrifying. My sense from off-the-record conversations with Chinese officials is that they feel a combination of alarm and giddiness at Trump’s possible (if unlikely) election. Alarm because he would be given the nuclear codes; giddiness at the power vacuum an incompetent Trump White House would open. There has been considerable confusion in the political discussion from both major U.S. political parties about free trade, trade with China, and the Trans-Pacific Partnership (T.P.P.). Awash in the rhetoric of the campaign, I’m sure nine out of 10 Americans, of any political persuasion, believe that the much-reviled T.P.P. is, as Donald Trump has said, a deal that would benefit China. Peter Navarro’s comments here talk about N.A.F.T.A. and China’s W.T.O. accession as trade deals that disadvantaged the United States. He doesn’t mention the T.P.P. specifically, but to me, the implication is clear that, like Trump, he’s talking about the T.P.P. Trump’s opposition to the T.P.P. often has been couched in criticism of China. That’s nonsense, because China is excluded from the T.P.P. No, China was not involved in the T.P.P. negotiations and no, it has nothing to do with T.P.P. deals. Neither trade benefits nor the restrictions of the T.P.P. will accrue to China. In fact, the T.P.P. is as much a strategic hedge against and challenge to China’s rising power as it is a trade deal between the U.S. and 11 other countries (Australia, Canada, Chile, Japan, Malaysia, Mexico, New Zealand, Peru, Singapore, Vietnam, and Brunei Darussalam). Chinese critics of US policy argue, with some justification, that T.P.P. is an example of the United States’ efforts to contain China. T.P.P. offers tariff-free access to U.S. markets to countries that compete with China for access to U.S. markets. China is in fact promoting its own Asian trade treaty, the Regional Comprehensive Economic Partnership (R.C.E.P. ), that would lower trade barriers to several of the same countries without the environmental, labor, food-safety, intellectual-property and other regulations that the massive T.P.P. deal requires of its signatories. Though eventually they might overlap, for now R.C.E.P. is a treaty that competes with T.P.P. One can debate the pros and cons of “free trade” in a globalizing world. Right now, both major U.S. parties have their economic nativists and internationalists. But it makes no sense whatsoever to argue, as now seems to be the Republican nominee’s position, that a) China cheats in its trade with the U.S. and b) therefore U.S. should oppose the T.P.P. If you want to cut a deal that is tough on China, as Trump claims to want to do, the T.P.P. is just such a deal. This conversation thread is about Republican China policy, but it is worth noting how Hillary Clinton, in running away from the T.P.P. she was involved in negotiating, has missed an opportunity to demonstrate both her own toughness on China and her opponent’s ignorance of foreign policy. While not supporting Trump's ill-informed proposals for how to deal with a continuing decline of manufacturing jobs in the U.S.A. and agreeing with Wertime on a need for a re-think on U.S. trade adjustment policies, nonetheless, Trump's position on the consequences of the C.C.P. state’s turbo-charged, neo-mercantilist version of East Asian Development State policies is in harmony with the critique of former Democratic presidential candidate Sanders and, as Ma writes, is backed by the data in the Autor, Dorn, Hanson paper. Is there a persuasive critique of the findings of that National Bureau of Economic Research (N.B.E.R.) paper that I have missed? Since neo-mercantilist Japan and Germany have continued for a long time to amass forex from industrial exports, why should one believe that the N.B.E.R. paper’s forecast that the P.R.C. will soon stop amassing forex from its neo-mercantilist industrial exports? Where Trump errs is in blaming trade agreements—which Trump neglects to mention were passed by the U.S. Congress because of Republican votes—on the other political party in the United States. The data on manufacturing decline in the U.S. and in all the other industrialized democracies, however, shows no inflections points linked to N.A.F.T.A. or Chinese entry into the W.T.O. There is, nonetheless, a problem. China's state mercantilist policies have taken advantage of the re-structuring of the world market which was transformed by technological changes and financial globalization which helped the global south grow much, much faster since 1982, now accounting for half of global G.D.P., a change which an ethicist might even praise as major moral progress, which, for better or worse, would not be a selling point in American politics. There are hard questions here. Sweatshop factories, such as the one my grandfather worked in in N.Y.C., is a step up the economic ladder for poor people with few skills. What the U.S. sees as raising labor standards is seen in poor countries as protecting rich countries from competition by the poor in their major comparative advantage, low wages. Talk of free trade when the world market is so very different from the world market era that gave rise to free trade doctrine is not helpful. Nor is it helpful to forget the role in the rise of the U.S. of infant industry protection, high tariffs, and intellectual property theft. There is considerable imprecision, narrowness, and risk in Trump's China narrative. The second fundamental problem with Trump's China narrative, reflected in Mr. Navarro's comments above, is that it seems to seriously misunderstand the motivations of China's leaders. As detailed in the extensive economic and political analysis on ChinaFile and elsewhere, China's economic policy is heavily driven by domestic concerns of prosperity and "social stability". China did not set out to displace American factory workers or derail the American economy. In fact, American prosperity and consumers play an important part in China's development model. A third problem with Trump's argument is normative. To demonize China at-large in the next great "war" engenders greater animosity in Chinese people. As we all witnessed after the recent arbiration ruling on the South China Sea, Chinese nationalism can burn hot when given the opportunity to direct itself at a foreign enemy. The U.S. further empowers Beijing autocrats by playing into this narrative. Echoing David Wertime, many Chinese look to the openness and tolerance of Americans as inspiration. A China policy which seeks to make enemies of Chinese people is counterproductive. The U.S. should win over the Chinese people by being a model of prosperity and dignity. This begins at home. America has economically disenfranchised much of its population over the past three decades, foremost because of its own economic and financial policies. While America's adjusted GDP has nearly tripled since 1980, wages have remained stagnant for most Americans. (Nominal GDP grew more than six times.) The size of the U.S. economy has grown 30% since China entered the WTO in 2001. (Nominal GDP nearly doubled.) The problem is not growth, it's distribution of new wealth and opportunity for the average person to enjoy that growth. Discrimination and marginalization of ethnic and religious minorities in America, a bulging prison population, and incredibly frequent gun homicides also damage our ability to serve as a model to China. Pursuing fairness and economic justice at home is a critical part of influencing China. In short, America's China policy should include modeling principled governance and leadership. But whether the Republicans under Trump are capable or willing to make America a model nation is a question that arouses great skepticism. The Republican Party has bigger problems than China policy. With Trump's nomination, the one thing that should concern Republicans is: can they continue to exist as a serious political party? If Trump becomes president, the rest of us have far, far bigger problems than China, too. Mr. Navarro speaks of Trump’s “position.” Given his candidate’s propensity to say one thing one day and the complete opposite the next, I find it impossible to tell what Trump’s position on anything is. One of two major parties has gone, to use Lindsey Graham’s immortal coinage, "batshit crazy". I doubt this will win the “respect” Mr. Navarro promises, from China or anyone else. If I were a policy-maker in Beijing, I would love to see Trump as president. With his criticism of the war in Iraq, praise of Vladimir Putin, and conditioning of Washington’s fulfillment of its defense treaty obligations on allies’ contributions — more broadly, with his idea that we have to fix things at home before we fix things abroad—Trump signals that he would hardly throw money down the South China Sea rat hole trying to match China’s rising deployments, merely to defend the interests of a bunch of feckless allies and other weak states that aren’t even allies. With his vagueness and self-contradiction on foreign trade - he was against it before he said in his joint interview with Mike Pence that he is for it—he shows that bluster on this topic is just the opening position for another lesson in the art of the deal. Trump is emerging as the ultimate “whatever works” guy: without fixed principles, he will follow the path of least resistance. This is good for China, because the easiest course in Asia would be to yield gracefully to the shifting balance of power, as recommended for example by Henry Kissinger, the Australian strategist Hugh White, and others. Whether this is really good for the U.S. in the long run is another question. I doubt it. From the Chinese government’s perspective, a Trump presidency would be a mixed blessing at best: Yes, as Andy Nathan rightly points out, Trump might pull back from the South China Sea, but this would likely quicken the pace of Japanese militarization. The net outcome of Trump’s apparent isolationism would, therefore, still probably be positive for the Chinese government, but perhaps not quite as positive as it would initially seem. On the other hand, a trade war with an impulsive and rash American leadership would create enormous economic risks for what is already a vulnerable Chinese economy. The Chinese economy is indeed shifting away from exports to domestic consumption, and from manufacturing to service, but that transition is unlikely to be rapid or thorough enough that an escalating tariff battle wouldn’t put a serious dent in growth and employment. That said, the very fact that Trump gets elected—if it happens—would deal such a severe blow to American soft power and the Chinese public’s perception of liberal democracy (as Sulmaan notes, Trump does not exactly command “respect” in China, or anywhere else) that it might substantially boost the Party’s sociopolitical popularity, at least in the short term. For the Party leadership, would that be worth the economic downsides? I’m tempted to say no—the Party State’s fundamental claim to legitimacy is, after all, growth and living standards—but the calculus is intriguing. The expertise needed for the U.S. to negotiate with China on a range of issues from trade to the South China Sea is vastly more complex than the skills Donald Trump has employed to strong arm hotel operators into giving him a good deal on operating kitschy hotels, and bargain small subcontractors down on their fees for renovating tacky casinos. Navarro and Trump's cartoonish idea—that you can swagger into a meeting room with the Chinese government and bully them into a deal that will magically solve every problem globalization has brought—is juvenile and unrealistic. Despite the bemoaning of partisan rancor in Washington there is in fact a new emergent bipartisan consensus, just one that internationalists in both parties will not like. The most ascendant and dynamic forces within both parties want to abandon the Trans-Pacific Partnership (T.P.P. ), do nothing to arrest the downward trajectory of the defense budget, and leave entitlements and the national debt untouched. What strategy are we poised to abandon? Since the end of World War II, Republican and Democratic leaders have agreed on several first principles of our approach to Asia. The U.S. has been one of the prime beneficiaries of these developments. Precisely because successive presidents maintained forward-deployed military forces and an engaged diplomatic approach, erstwhile enemies have become friends, rivalries have been tamed, and Asia has become the driver of global growth. Moreover, the American homeland has been safe from threats emanating from the Pacific. How will the U.S. manage China’s revisionism? Republican and Democratic internationalists agree that the three pillars of American post-war strategy should be updated and strengthened, but the core of their parties do not. The current presidential aspirants may not agree on the wisdom of continuing our successful course in Asia but do seem to share a disinclination to pay the necessary costs or convince the American people that trade agreements, an adequate defense budget, and entitlement reform are prerequisites of an activist Asia strategy. So, perhaps a sharper question for voters in November is this: What is better, minimizing our policy commitments to align them with our declining resources? Or, continuing our rhetorical devotion to a policy we have no intention of paying for? Either choice will hurt America’s security and well being. The first will recklessly cede Asia to China and the second amounts to a dangerous bluffing strategy that eventually will be punctured. Perhaps a new president will abandon key promises to constituents. If not, one responsible course for internationalists is to start to analyze the commitments we will need to abandon. Though China’s current regime is no democracy, China long has been more or less a rule-abiding, cooperative and responsible player in international affairs. Unfortunately, it is no longer the case. In recent years, China is becoming more and more provocative internationally, as exemplified by its renewed encroachment in the South China Sea. Foreign enterprises in China also complain about increasingly unfair treatment and even harassment. China’s assertiveness scares many of its Asian neighbors. Like it or not, many Asian countries count on the U.S. to balance China. U.S. commitment to the region is an important force that delays a dangerous arm race between China and its worrying neighbors. To be sure, U.S. foreign policy record is packed with precedents of unilateral actions that allegedly violate international law. But at times, the U.S. is an indispensable force that creates and upholds a multilateral, rule-based international system. For decades, the U.S. China policy that crosses the partisan divide has been to encourage China to participate in such an international system. This policy has successfully brought prosperity to both countries as well as stability in Asia. Confronting China’s new provocation, Washington has two options: to work with other Asian countries to encourage and pressure China to get back onto the track of rules-based multilateralism, or to force China to yield through raw rhetoric and harsh sanction. Donald Trump is poised to the latter option as he threatens an all-out trade war with China. Beijing will see this as an act of bullying. No leader in China can afford appearing weak by yielding to such perceived arm-twisting. This will also enable Beijing to conveniently blame the U.S. for its unfolding economic crisis. Trump’s approach would push China to dig its heel further into its confrontational disposition. As such, U.S.-China relations would soon turn into a clash of two bullies. Trump’s apologists might say such a clash is not a bad thing if it could make China yield. But other components of Trump’s foreign policy, as Andrew Nathan points out above, contradict this goal. Trump’s suggestion of scaling back U.S. commitment to its allies would isolate the U.S. in the Asia Pacific. Moreover, the highly sophisticated, advanced, and open U.S. economy would fare badly in any protectionist trade war. As many of us might have learned on the school playground, a lone bully who wears expensive clothes is unlikely to win in a fight with a bully with less to lose. Let’s imagine a dystopic America in which its cocky president talks tough to China (and other foreign competitors) but fails miserably in real international confrontation, then shifts the blame to domestic minorities and redoubles his efforts to fan internal hatred, division, and persecution, just like a failed bully who compensates for his humiliation on the playground by beating his own weaker siblings back home. Is such an American dystopia close to becoming reality? I hope not.